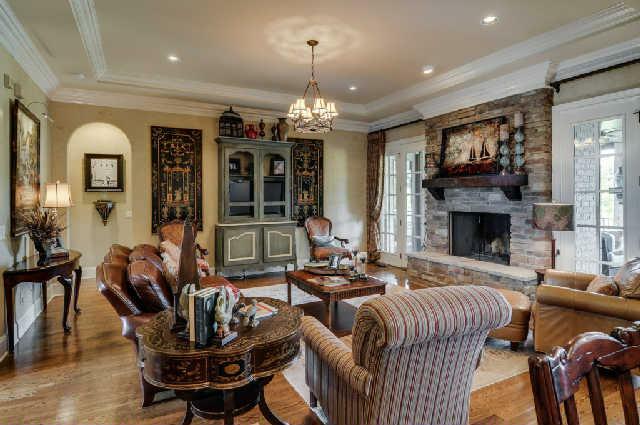 If you’re in the market for a superior home situated in a beautiful setting, look no further than 9240 Carrisbrook Lane in Brentwood’s premier neighborhood – Annandale. 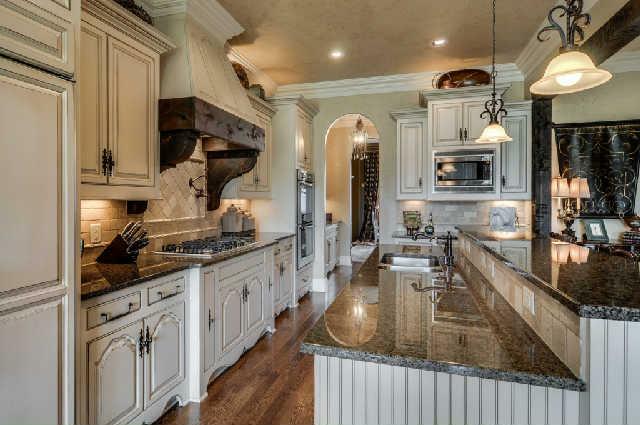 With 4,796 square feet, this five bedroom and five and one half bath, two level home has been thoughtfully designed, and has all the space and custom finishes your family desires. 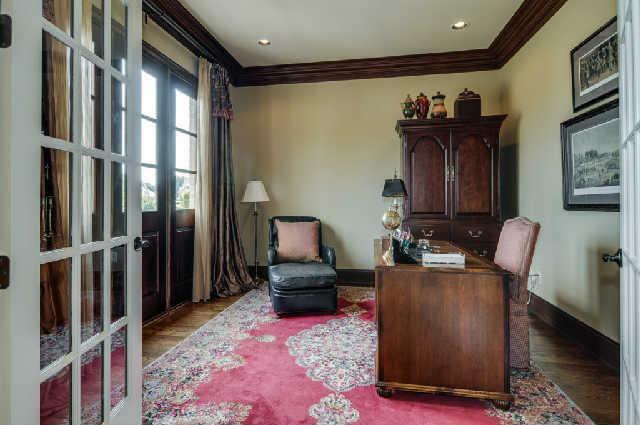 In addition, it boasts a three car garage on approximately a half-acre flat lot and is offered at $1,100,000. 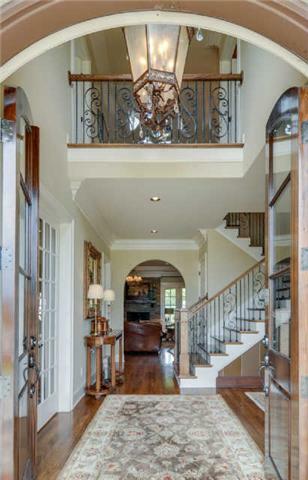 Upon entering the impressive solid double mahogany wood door entrance to 9240 Carrisbrook Lane, you immediately recognize this home is unique. 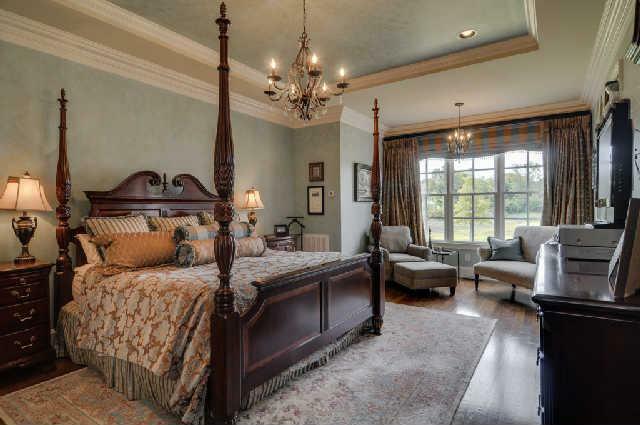 It features upscale touches like arched entryways, iron railings, impeccable hardwood floors, thick crown moldings, unique beams and gorgeous chandeliers. 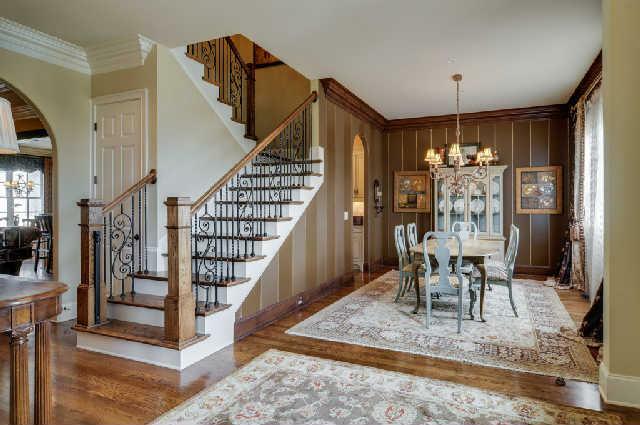 Off the entryway is the dining room on the right, featuring a stunning accent wall of solid wood paneling, warming the room and lending itself as a natural conversation piece. To the left is your private office with double French doors for privacy, and numerous windows which allow plenty of natural light to filter in from the outdoors. 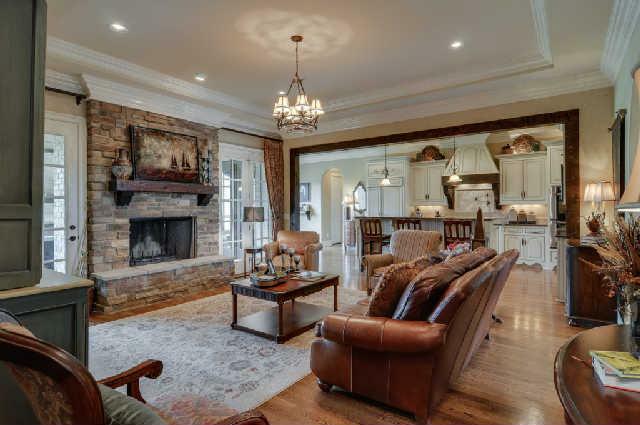 Straight ahead is the great room which is anchored by an impressive stacked stone fireplace, flanked on each side by French doors leading to the covered porch. It’s an ideal spot for entertaining guests, as it connects to the kitchen by a generously oversized beamed doorway. 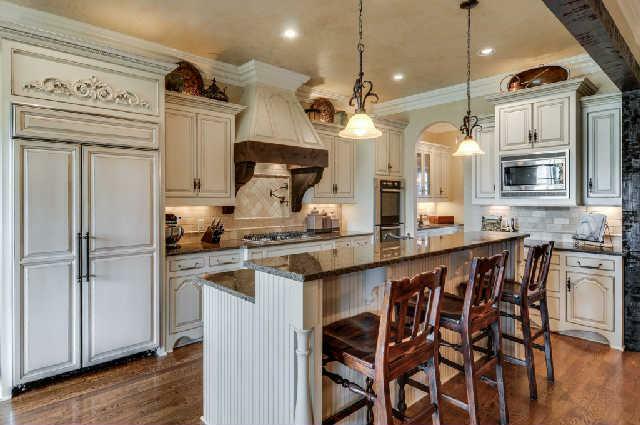 The kitchen is a chef’s delight with light custom cabinetry, double ovens, granite countertops, accent lighting, paneled refrigerator doors and butler’s pantry, which also conveniently connects to the dining room. The spacious island bar is large enough to comfortably sit three, while the kitchen also includes an eat-in area next to a large wall of windows overlooking the flat backyard, and another door to the covered porch. 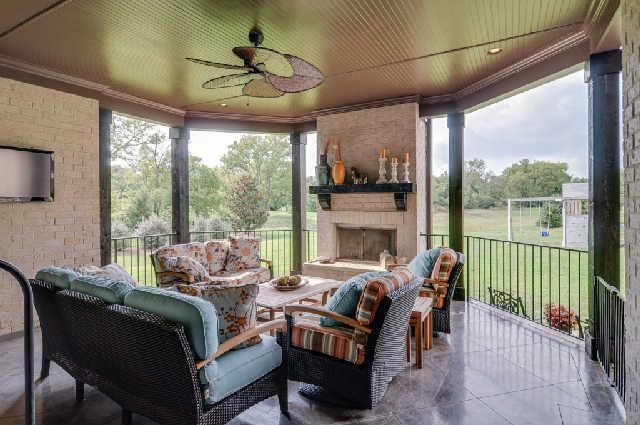 The covered porch is the perfect outdoor spot where family or guests can gather. 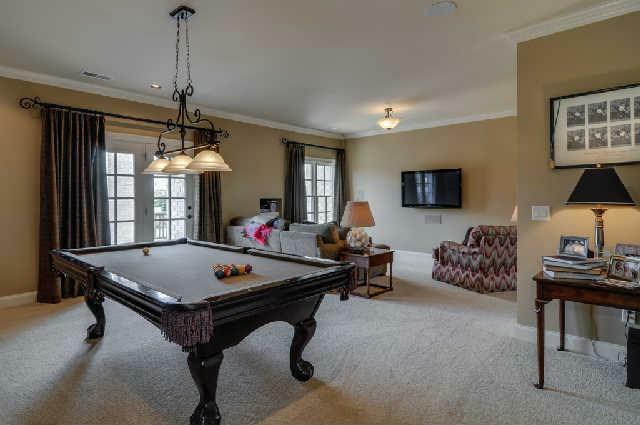 It features upscale touches, yet is warm and inviting and includes a brick fireplace, bead board ceiling, tile flooring, and space for a wall mounted flatscreen television. The great room and kitchen area, along with the covered porch, are seamlessly connected and an entertainers dream come true. Two of the five bedrooms are on the main level including the large master bedroom which includes a generous sitting area in which to unwind and separate closets. 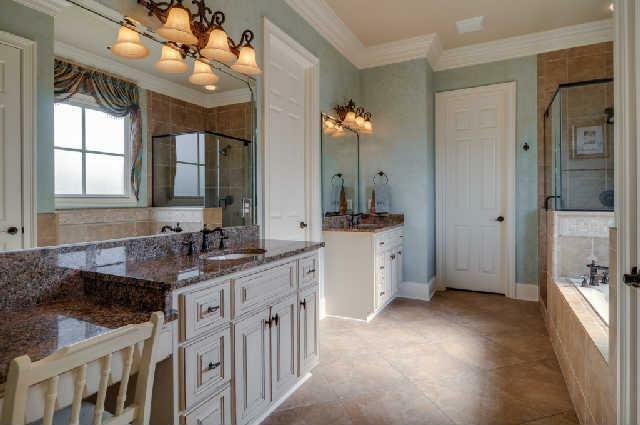 The en suite master bath features his and her sinks, shower, large soaking tub and beautiful touches like granite, oil bronzed finishes and beautiful neutral tile. Upstairs you’ll find the remaining three bedrooms and baths, along with two huge bonus room – spacious enough for a sitting area along with a ping pong or billiard table for the kids. What’s more, residents of Annandale enjoy a resort style pool, cabana, and walking trail that meanders through the lakes and fountains of the development – perfect for walking, jogging or biking. 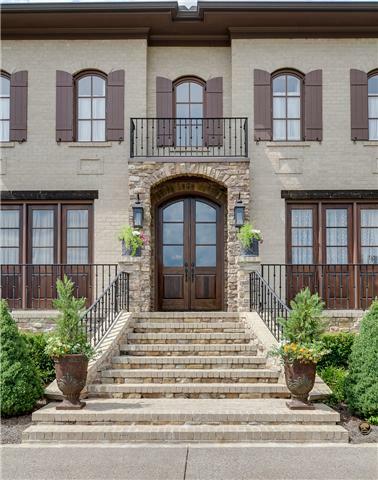 The neighborhood’s also conveniently located near the I-65/Old Hickory Boulevard interchange. 9240 Carrisbrook Lane is zoned for Lipscomb Elementary, Brentwood Middle and Brentwood High. 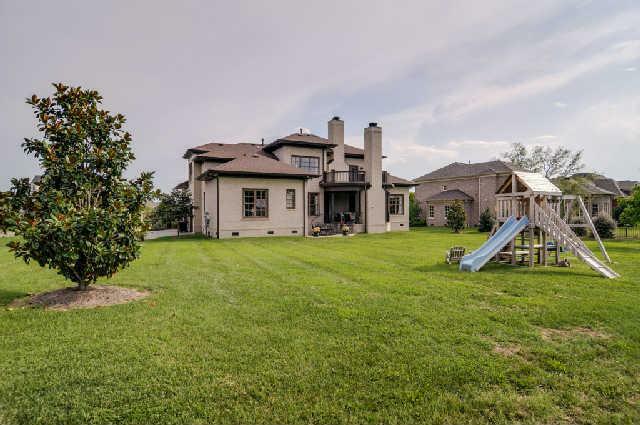 For more information, or to see this property, contact Alison Davis with Pilkerton Realtors today, (615) 371-2474. www.PilkertonRealtors.com. Click here to view complete property listing.